Not far from Pinetops sits Wilson, North Carolina, where the city of about 49,000 enjoys the benefits of a publicly owned fiber optic network, Greenlight. Pinetops officials asked Wilson to expand Greenlight to their town, but state law precluded Wilson from offering broadband beyond county lines. Pinetops and the local Vick Family Farm, a large potato manufacturer with international distribution, were both desperate for better services, out of reach, and out of options because no other ISP would help them. Wilson and Chattanooga joined together to ask the FCC to preempt the restrictive state laws in Tennessee and North Carolina, and in February 2015, the Commission agreed with them. The FCC overturned the state laws, which gave Wilson the opportunity to deploy fiber optic infrastructure to both Pinetops and the Vick Family Farm. Within months, businesses in Pinetops felt the positive effects of affordable gigabit connectivity. People who had difficulties finding employment in the past had new online opportunities. Local schools, government offices, and other facilities also signed up for reliable high-speed Internet access at affordable rates. When the state appealed the FCC ruling and won in the Sixth Court of Appeals in 2016, suddenly Wilson was violating state law. If they did not remove Greenlight service from Pinetops, the entire community of Wilson risked losing the exemption to North Carolina’s law. Instead of just ceasing service to Pinetops, however, Wilson chose to provide high-speed Internet service temporarily at no charge. Gigabit connectivity had proven to be too valuable to Pinetops; sending them backward seemed cruel. City leaders in Wilson and Pinetops joined together and approached state legislators to ask for special legislation that would allow Wilson’s Greenlight to continue to serve Pinetops. Even though Suddenlink and CenturyLink had passed on the opportunity to provide better connectivity in the small town, their lobbyists interfered with the legislative process. In order to prevent Greenlight from expanding beyond county limits to serve Pinetops, representatives from the big national companies used their influence with state legislators to amend the original proposal. The original version of HB 396 only added a few lines to existing law, simply expanding on the current exemption for Wilson which allows it to offer communications services. Within a month, however, lobbyists had managed to draft an amendment that added language that requires Wilson to end Greenlight service within 30 days if a private provider offers FTTP service in Pinetops. With the adoption of HB 396, we see North Carolina’s State Legislators deciding who wins and who loses as the General Assembly handily eliminates competition for Suddenlink or any other provider who might have decided to move into Pinetops. In addition to deciding who gets to do business in Pinetops, the General Assembly also chose to sentence the people of Pinetops to Internet access from a company with a reputation for poor customer service. Residents and businesses in Pinetops have enjoyed steady and affordable rates from Greenlight, but as a recent study reveals, private ISP rates are typically more expensive and tend to fluctuate. HB 396 included no language to ensure that Pinetops subscribers would not face rate hikes and no requirement that an incoming ISP adhere to a prescribed standard of customer service. The bill provides plenty of benefits for ISPs that may decide to dabble in Pinetops, but no protections for the people who live there. For residents and businesses that see gigabit symmetrical connectivity from Greenlight as a way to keep their town from shriveling away, HB 396 was filled with red flags. Pinetops residents had no leverage. Susan Coker Craig, a local business owner and a former Town Commissioner, says, "It’s amazing to me that our legislature is reversing our technological advances; it’s ridiculous. Ridiculous." The bill passed in June 2017 along with the potential problems it carried. Coker Craig said that community leaders in Pinetops knew that they still ran the risk of losing Greenlight but they were "cautiously optimistic" that Suddenlink would "just leave them alone." After all, the company had spurned them before and they were still the same small town; deployment to tiny Pinetops didn't seem like a wise business decision. Community leaders thought perhaps Greenlight would keep Suddenlink out of Pinetops. Instead, the legislature has paved the way for Suddenlink to push Greenlight out. In March of 2017, a Suddenlink representative appeared uninvited to a Board of Commissioners meeting. He told the Board that Suddenlink would be deploying fiber in Pinetops in the future and that the company was already in the “walk out” construction phase. He'd also said that the company would not compete with Greenlight, a statement that gave community leaders hope that Suddenlink would stay away if Greenlight remained. At the time, State Representative Susan Martin was working with Pinetops and Wilson in an attempt to draft and pass a bill to keep the small community connected to Greenlight. The company’s representative, Bill Paramore, told town leaders that Suddenlink would not enter Pinetops if Greenlight stayed; the ISP was only willing to compete with CenturyLink. Paramore, who is Vice President of Operations, told the Board that he was a member of the Board of Directors of the North Carolina Cable Telecommunications Association (NCCTA). NCCTA is one of the lobbying groups that would pressure state legislators to refuse any exemption that did not include a condition forcing removal of Greenlight when a private ISP offering fiber came to Pinetops. Paramore told the Town Board that Suddenlink was not involved in the exemption issue for Pinetops. HB 396 should have been an easy fix, but the big incumbents that feared Wilson’s Greenlight and the standards it set hijacked the bill. Coker Craig and Wooten wanted the bill to include language that would ensure Pinetops would obtain comparable service from any private sector provider that entered the market there, but it was stripped out. This is not about what’s right; it’s about the big telecoms going against the public sector. Suddenlink has no profit to be made in Pinetops.…It’s funny to me to see how CenturyLink doesn’t have a problem of Suddenlink coming in and taking their business. We are concerned that Suddenlink’s commitment to Pinetops is based solely on the pending legislative exemption for Greenlight. Our citizens have no guarantee that this service will be provided as promised, and we question whether we will be left again with a large corporation providing sub-par service, terrible customer service, and no real competition to drive them to do better…We are concerned that their interest in serving or upgrading service to Pinetops will also fade without Greenlight service being available here. Now Suddenlink has a crush on Pinetops. With HB 396 in place, Suddenlink can kill several birds with one stone. Greenlight has been attracting scores of positive press in Pinetops by helping a modest rural town show what it can do with publicly owned fast, affordable, reliable connectivity. Now, Suddenlink can stop any other towns — especially larger towns where there IS population density — from chasing the idea that publicly owned Internet infrastructure is something worth having. Suddenlink was also able to use the North Carolina Legislature to eliminate a competitor. While HB 396 only applies to a single community, let’s hope this type of sledgehammer is never again taken out of the tool shed. Pinetops and Wilson saw the dangers in the language of HB 396, but the community had no power to negotiate once the Sixth Circuit Court of Appeals reversed the FCC decision. The situation is also a chance to bully upstarts Pinetops and Wilson. Certainly, companies such as Suddenlink are getting sick and tired of facing down towns that decide to invest in Internet infrastructure. When Wilson and Chattanooga challenged state laws in 2015 to reverse laws discouraging publicly owned networks, big ISPs circled the wagons. Their influence paid off when the decision was reversed, but they believe that pursuing local troublemakers is a way to put local communities in their place. Are there other small towns in North Carolina where Suddenlink might offer similar services? We checked with the Mayor in nearby Macclesfield, who told us that Suddenlink has not approached them about providing service in their town. Macclesfield is very near Pinetops and, at one time, Mayor Trey Lewis hoped that the exemption for Pinetops would extend to his town of about 471 residents. Now the town is loping along on DSL from CenturyLink the way they have for years with no possibility of service from Greenlight. There is CenturyLink fiber in Macclesfield serving Heritage Hospital and, even though there are fewer households there than in Pinetops, average household income is about $5,000 higher. Macclesfield is three miles from Pinetops and approximately the same distance from Rocky Mount. Mayor Lewis has not been contacted by Suddenlink, but he says he’ll reach out to them if or when Suddenlink comes to Pinetops. Suddenlink rep Bill Paramore told the Town Board in March 2017 that the ISP would not offer symmetrical services and that any gigabit download speeds would be paired with maximum 50 Megabit per second (Mbps) upload speeds, which he described as a “gracious plenty”. The rep added that a 50 Mbps download tier would have only 5 Mbps upload speeds. He went on to arrogantly proclaim that only large corporations that sent large files internationally needed such high capacity upload speeds. For people in Pinetops, their first concern is losing access to reliable symmetrical gigabit connectivity. Access to fast upload speeds has improved efficiencies for local businesses and created opportunities for residents. With limited employment options in such a small town, people living in Pinetops have branched out via the Internet and many now work remotely. Before access to symmetrical gigabit service, they didn’t have the infrastructure to pursue online positions. Coker Craig has a neighbor who works at home for BB&T, a large bank with branches in Wilson and Winston-Salem. Each day, her employer emails a large batch of work and she returns the documents via email when she's done processing them. When she depended on CenturyLink, uploading the finished product took hours and reliability was always an uncertainty; changing to Greenlight reduced the process to minutes and she no longer worried about an unreliable connection. "That's just one example," says Coker Craig, "There are lots of people who are upset at the thought of having to go back." In the documentary, Do Not Pass Go, other residents who work from home describe how they are dependent on high-quality connectivity to earn a living. Mark and Tina Gomez state that they will consider moving elsewhere to preserve Tina's job if she’s unable to obtain high-quality Internet access with fast upload speeds. Carmon tells us that Suddenlink wants the town to lease or sell land on which the ISP can install a substation. They’ve told town authorities that they won’t need poles, implying an underground deployment, but no one in Pinetops has seen a design. There have been no requests for negotiations on a lease of property or discussions about right-of-way. The city owns it’s local utility poles. Carmon says that Suddenlink’s lines outside of town appear to come to the edge of town on poles which he believes belong to a rural cooperative. Carmon says that, for now, they'll wait until they know more. Town leaders don’t know what services Suddenlink might offer or how much they would cost. In Tarboro, about 15 minutes northeast of Pinetops, Suddenlink offers services in the city of about 11,500 people. Suddenlink is lacking in upload speeds and long-term value. As can be expected, Suddenlink advertises special rates for the first year of service in Tarboro, but doesn’t disclose what rates are after the introductory price is over. Greenlight doesn’t rely on gimmicks like low introductory rates that increase over time. The municipal network offers four tiers to choose from and all provide symmetrical speeds. With upload speeds that equal only a fraction of download speeds and prices that will increase after the first year, Suddenlink service in rural Pinetops will not be the economic development tool they need. When compared to Suddenlink, one can see that customers on Greenlight are more likely to have the ability to use the infrastructure as a way to participate in the online economy, rather than just function as consumers. 100 Mbps/100 Mbps $74.95/month 100 Mbps/10 Mbps $39.95/month for first year, after ? 400 Mbps/40 Mbps $59.95/month for first year, after ? 1 Gbps/1 Gbps $99.95/month 1 Gbps/50 Mbps $89.95/month for first year, after ? For a rate that matches Suddenlink's introductory price, Greenlight offers its base tier of symmetrical 50 Mbps connection that will not increase in price after a year. In a place like Pinetops, where average incomes are lower and high paying jobs are harder to come by, a fast connection at this affordable and predictable rate can be the key to being connected. Suddenlink also imposes data caps; Greenlight does not. Access to the Internet is more important as having a decent highway systems, electric system, all the utilities included, and Pinetops deserves to have the best Internet access available to us. That’s the only thing that's going to help the town grow. 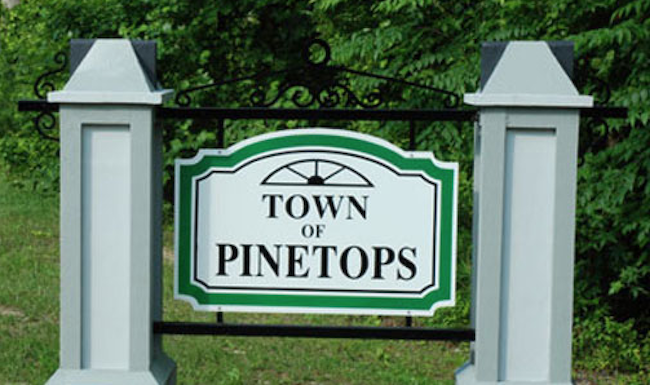 Image of Pinetops's town sign courtesy of Edgecumbe County Economic Development.